AVTEK Solutions has started 2018 with a bang after securing 3 major curtain walling contracts worth in excess of £2 million to bolster their order book for the year ahead. The projects, all within the Scottish education sector, include working for main contractors Sir Robert McAlpine to design, supply and install curtain walling, windows, doors and Brise Soleil for the University of St Andrews’ new student accommodation. Avtek will also be responsible for the installation of Velfac windows in their part of the project which will deliver an additional 500 new rooms for Scotland’s first university. Avtek has also secured a contract with Morrison Construction to provide the full design, supply and install service for their curtain walling, windows, louvres and automatic doors at the new St Dominic’s Primary School in Airdrie which is being constructed following a fire to the original building in 2015. However, the biggest contract of the haul is at the new Bertha Park School in Perth for Robertson Construction which is due to open in August 2019. AVTEK Solution’s scope involves the design, supply and install of curtain walling, windows, doors and Louvre screens. This successful start to the year reinforces the Fife company’s ambition to become Scotland’s leading specialist façade contractor who pride themselves on delivering a full-service solution of design, manufacture and install which enables them to provide complete control over the quality, service and lead times. 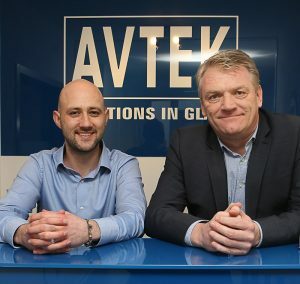 The contract awards build on the success of AVTEK solutions which has doubled in size every year since it was established in 2014 – a factor which was instrumental in their success at becoming a finalist in the Fife Business Awards.